In Louisville, KY and the surrounding counties, we can have a problem with Radon in our houses. The only way to know is to test. Homes with basements are not the only places that Radon can be found. Radon can be found in homes with crawl spaces and in homes on a slab foundation. The Louisville, KY area is in a belt of higher Radon levels. 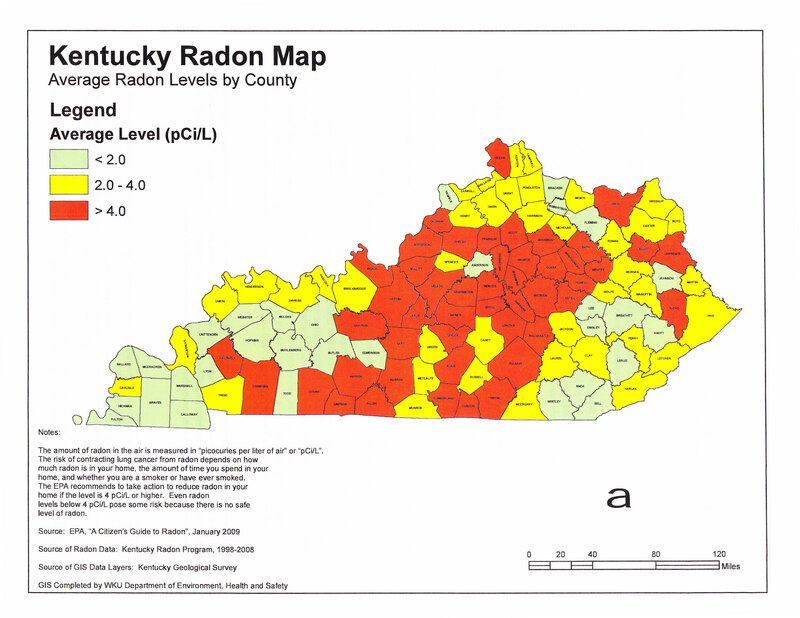 Consumers can ask for free Radon test kit from the state of Kentucky. This site also has a lot of information including Radon myths. Most home inspectors offer to test for Radon during their regular home inspection. Normally, they will set up a meter for at least 48 hours. The Radon meter will sample once an hour and give you a current reading as well as an average. Some of the better Radon monitors have the ability to hook up to a computer and let you print out the average results as well as a graph. This is a 48-hour graph of our house. Obviously, this house needs Radon Mitigation with an average of 12.4. What if a Radon level of over 4 picocuries is discovered in your new home? The EPA would recommend Radon mitigation by a professional. Costs can vary widely, but $800-1,000 is a decent range of what a lot of systems are installed. Converting a passive Radon system to an active system is the cheapest and mitigating a crawl space is the most expensive. A passive Radon System typically is a 3-inch pipe from the sump pump area through the roof of the house. There will be a small flow of air through the pipe that occurs naturally. Converting this to an active system would involve installing a fan in the pipe providing a constant movement of air and negative pressure under the concrete. One of the most important things in Radon Mitigation is the retest. How do you know if the radon is mitigated if you don’t test? In the example given, the retest was 6.1 and not acceptable. We were able to move the suction point and receive an acceptable reading. We have a lot of information about Radon in KY on our website and have some PDF documents from the EPA as well as information from the state of Kentucky. Feel free to contact The Hollinden Team if you have any questions about Radon or the Real Estate market in Louisville, KY. Even if you live in an area on the map that has a low radon rating, you should still have your home tested!